Healthy relationships do not just happen. It takes two people who embrace imagination as the oxygen that keeps the love alive. And you deserve to breathe in the love. Let us face it, first dates can be awkward. Some would say pure torture. You are trying to be perfect. He is trying to be perfect. Neither of you are perfect, whatever perfect means. And, realistically, does pretending to be perfect prove he is a man who can love you? Of course not. So are you ready to get past the pretending and find the love of your life? Well, girlfriend, there are three traits that frogs lack and princes have in spades. And checking off the frog or prince box is as easy as watching his body language, listening between the lines and trusting your intuition to discern if he has what it takes to be crowned prince. Let us look at these three traits: integrity, communication and imagination. Trust cannot be pledged or promised. Trust is earned through testing and tenacity over time. Only then will you know you have found a man of integrity. Only then, when he promises to love you until death do us part, will your heart know he means it. Granted, you cannot learn in one date if he pays his bills on time, keeps his promises or is telling the truth about his past. But, as Shakespeare surmised, you can trust what you see in his eyes, no matter what he is saying. When he talks or when you talk, does he look into your eyes? Do his eyes linger on yours, then look away to give you space? Do you feel comfortable when he looks at you? In those moments of integrity and intimacy when lovers hold each other’s gaze, they share a depth of intimacy that goes beyond physical touch. Likewise, how easily Mr. First Date looks into your eyes can reveal how vulnerable he might be as your lover later. After all, if he will not look you in the eyes over sushi, what do you think will happen between the sheets? By the way, your intuition does not consider this a hard question. 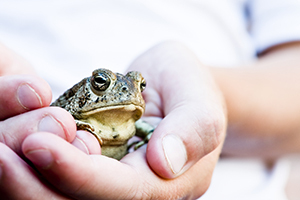 Remember, his answers may or may not be helpful to determine a frog from a prince. What can often be even more telling are your answers to: Does he monopolize the conversation, interrupt or use a condescending tone? Does he ask sincere questions about my likes, dislikes, family, career, hopes and dreams? Does he reciprocate with the same information about himself? Does he share his flaws as easily as his positive points? Does the conversation seem equal in time and interest level? We humans are the rare species that speak; yet words are only 10 percent of what we say. The other 90 percent does not involve talking at all. Body language reveals that which his words may not — his eyes, body, facial expressions and tone of voice can reveal the real truth behind his words. There are five body-language basics: leaning back (withholding, judgmental), leaning forward (generous, interested); shoulder shrugs (disinterested, disrespectful, clueless), relaxed shoulders (comfortable, honest, open); tight lips (secretive, withholding truth, rigid), relaxed mouth (truthful, open, easy going); clenched fists (closed minded, rigid, defensive), open hands (open-minded, open heart, generous); and blinking or squinting (deceptive, uncomfortable) and open eyes (truthful, comfortable). To be fair, chances are good that he is never going to need, want or succeed at communication as well as you, but finding a man willing to give it his best shot may be worth a second date. For now, you need to discover how comfortable and respectful he is with mutual conversation. If you feel you are walking on eggshells, it is time to check the frog box and move on. Imagination does not show up as a princely trait in fairy tales very often. But, could it be an important trait for your prince? Would you be more likely to say “yes” to a man inviting you to a movie or a man who plans a date focused on getting to know you? That is where imagination comes in, and you can discover his creativity before you even meet. When he asks you what you want to do for your date, put it back in his court. You need information, and the kind of date he designs tells you how creative and fun he is. For instance, 10 points go to the guy who treks with you along a shore, challenges you to a game of miniature golf, walks with you through a farmers’ market or meets you for a picnic in the park. (Double points if he brings a kite and triple points if he makes the food.) This man actually understands the purpose of your date. And, if he thinks outside the box on a first date, imagine where his imagination may take you later on. Other advantages of a man with a creative mind are being open to new ideas, considering other points of view, finding win-win solutions, enjoying conversation and expanding discussions with open-ended questions. He is also likely to be playful, flexible, optimistic and generous. Are any of these traits on your prince list? Whether you escape after five minutes or happily linger longer than you had planned, the moment the date is over, tune into your intuition. What are you feeling? Make sure you are 100-percent honest with yourself. On a scale of 1 to 10, with 1 being you are checking for warts and 10 you are planning the future, do you feel validated, respected, encouraged, wanting more or insulted, bored, disappointed or thank God it is over? If you paid attention, you know if and why you want to see him again. Just one word of caution — a first date can weed out an obvious frog, but some very clever frogs have been known to play prince right up to their wedding day and even beyond. So remember, it is up to you to watch for the warts, because kissing a frog and turning him into a prince only happens in fairy tales. Morgan Rose has a master’s degree in counseling psychology, in addition to being a researcher, educator, activist and two-time cancer survivor. She is the author of On Becoming Naught a Bimbeax: The Smart Woman’s Guide to Finding Her Prince Without Ever Kissing Another Frog. www.naughtabimbeaux.com.